Having a plan for your estate is vital. Here are 10 things to look for before hiring an estate attorney to make sure your assets are handled appropriately. If you're reading this, you might think estate planning is far off into the future, even if you're already considering it. But you need to be interviewing an estate attorney, whether you're in your thirties or your fifties. The truth is, 62% of Canadians don't even have a last will, and another 11% have out-of-date wills. This traps their families in messy legal battles. This is why you need a good attorney to plan and manage your estate. Here are the ten things you should be looking for. Before you do anything else, you should know what you need from an estate attorney. This includes knowing what they do and what services they provide so that you know what questions to ask them. An estate attorney, sometimes called a probate attorney, is a lawyer who advises clients on how to get their affairs in order in preparation for the possibility of mental deterioration and death. You're probably thinking of a lawyer who reads the will to family members. However, the duties of a probate attorney don't end with a last will and testament. For example, they may also draft living trusts, help you draft a plan to avoid estate taxes, and help ensure that your life assets are safe from your beneficiaries' creditors after your death. For a full breakdown of what estate planning entails, read our estate planning brochure. With this in mind, what makes a good estate attorney? Above all, you want to find an attorney who specializes in estate planning. The whole process is complex, and even the best general practitioner may not have the knowledge base required to ensure you and your family receive the best assistance possible. To that end, they should be well versed in the laws in your state and up-to-date on any current changes. 2. Do They Primarily Focus on Estate Planning? Which brings us to our next point: do they focus primarily on estate planning? If you need a simple will, power of attorney and health care documents, you may be able to get away with a generalist. However, if your family or financial situation is more complicated than the basics, or if your estate is taxable, you need someone who focuses on estate planning. Either way, you do need an estate plan, and you need someone who can help you build it. If you're not sure where to begin with estate planning, our estate planning questionnaire is a good place to start. There are a number of directories available online, as well as bar association referral hotlines. You'll also run across a lot of slogans and hype, like "we help you avoid probate" or "we care for you". Understand two things. First, lawyers pay to be a part of those directories, and their presence there isn't necessarily an indicator of quality. Second, slogans don't mean anything unless an estate attorney has the experience and testimonials to back them up. Instead, get a referral. The best place to look for one is with another attorney or financial advisor you know and trust. 4. Do They Assist with a Revocable Living Trust? Once you've found an estate attorney, you can start asking the big questions. For example: do they assist you in properly funding your assets into a living trust? Many attorneys are wizards in creating estate plans for their clients but fall short of funding a revocable living trust. Which is a problem, because a well-drafted trust becomes functionally useless after you die if your assets aren't titled to the trust while you're alive. And at that point, your family is stuck with a huge financial mess. Also called a living trust, it's a legal entity created to hold ownership of an individual's assets. It covers three phases of life: your lifetime, possible incapacitation, and what will happen to your assets after your death. In the first phase, the trust is designed to have provisions allowing you to continue using your assets as you see fit. You also reserve the right to undo it (thus the term revocable). In the second phase, should you become mentally incapacitated, the trust will include provisions on what should happen if you can no longer manage your own affairs or the trust. This includes naming someone to step in to manage your affairs and assets. Finally, in the third phase, the trust becomes irrevocable once you die (in other words, no one can make further changes to it). The successor trustee (the person named to manage your affairs and assets) will pay off any remaining bills, debts, and taxes and distribute your assets among your beneficiaries. How they do this was outlined in the trust while you were still alive. The whole goal of a living trust is to plan for what will happen if you're unable to manage your assets yourself. Even if you don't have many assets, this can save you and your family thousands by keeping your assets out of court-appointed guardianship. This is also important if you are single and have assets titled in your name alone. This is for two reasons: it keeps your assets out of court-supervised guardianship, and it keeps your beneficiaries from having to deal with the probate process. What Can Your Estate Attorney Do to Help? The key to a living trust working the way you need is having it drafted correctly while you're still able to make decisions to change it yourself. This is where an estate attorney is vital. It's also where you need to do your homework. Some firms will have whole departments devoted to funding. Others will give you comprehensive instructions, while others will mention funding without further guidance. While interviewing your potential attorney, you need to pick their brain about what services they offer related to living trusts. The best case scenario is working with an attorney who will oversee the whole funding process. It may even be worth paying an extra fee for this service if you have to--chances are, you won't get around to all the funding yourself, and you want to make sure it's finished. This is why you need to ask whether your attorney offers a formal updating and maintenance program, which falls into the latter category. This service is typically offered for a small fee. After your estate plan has been completed, your attorney will contact you annually or semi-annually to inform you of any changes to the law, ask about any life changes that would require modifications to the plan, check the progress of the funding and keep you in the loop on any new planning techniques. This added service is key to making sure your plan is up-to-date and reflects your life as it currently stands. 6. Do They Carry Malpractice Insurance? Nobody wants to think about legal mistakes. But there's something to be said for asking about malpractice insurance. If your estate attorney carries malpractice insurance, that's a good sign. It means that your attorney is willing to be accountable for any future mistakes, and malpractice insurance is a sign that they think well enough of their clients to protect them against costly errors. Keep in mind that in many states, lawyers aren't legally obligated to carry malpractice insurance. So make sure to ask. In case you were wondering: a shorter project time isn't implicitly better. You want a quality estate plan, not a quick one. Even if you have a fairly basic, easy-to-manage estate, there's no reason to rush through it. And while you're talking with your attorney about the length of your project, you should also ask if they'll provide documents for you to review at each step of the way. The whole goal here is to stay out of the probate process (more on that in the next section). 8. Will They Help Avoid the Probate Process? We mentioned earlier that an estate attorney is sometimes called a probate attorney. Which is somewhat ironic considering that the whole point of hiring an attorney to get your assets in order is to help you avoid the probate process. If an attorney waves off probate, there should be alarm bells ringing in your head. If they aren't that keen to avoid probate, the attorney in question is likely more concerned about their income than your estate. First, you have to understand the key difference between estate planning and the probate process. 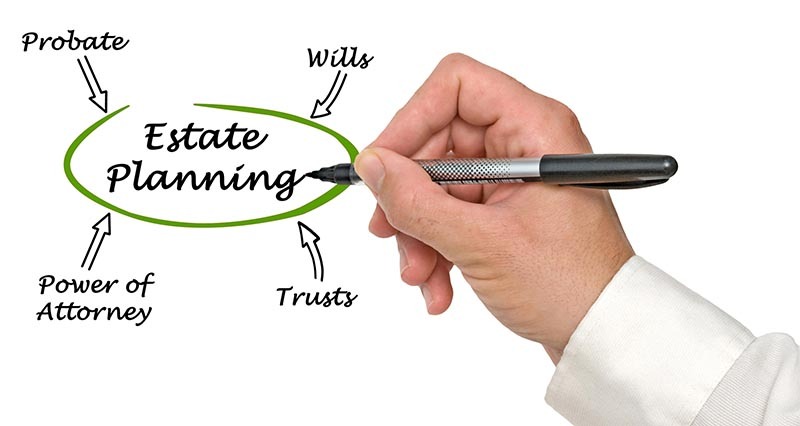 Estate planning is what you do before you die to manage your assets. Probate is what happens after you die to get your affairs in order. The shortest way to describe estate planning: the process of avoiding probate. If your estate planning is in order and properly set up before your death, then you should be able to keep your estate out of court altogether and distribute your assets according to the estate plan made while you were alive. Probate is what happens when your affairs weren't fully in order before your death, making it necessary for the court to step in and pick up the slack. The length of the probate process and the fees associated with it vary based on where you are and the size of your estate. But as a rule, probate expenses alone will eat up at least 10% of your estate value. And on top of that, the probate process can take years to complete depending on the state of your affairs and the size of your estate. All the while, your family is racking up legal fees trying to sort it out. If a lawyer is trying to push you in the direction of a will and probate, run in the opposite direction. And once you've figured out where your estate attorney stands on probate, you should also make sure that they're crystal clear about fees. Note that while many attorneys won't give you a quote prior to an appointment, and that will make you uncomfortable, it often isn't possible to give an exact estimate of what your estate planning project will cost without looking at the particulars of your estate. However, they should be able to give you an approximate range based on what their fees are. On the other end of the spectrum, you should be wary of attorneys who give a flat fee without examining your case at length. You should also be wary of attorneys who charge by the hour because there's a chance they'll keep extending the process for hourly fees. On that note, some attorneys will switch from a fixed rate to hourly fees after a certain amount of work is finished--make sure to ask so you aren't surprised later. 10. Can You See Yourself Working with Them? Finally, technical details aside, you should ask yourself if you can see yourself working with this attorney. This is a vital question to answer before you hire an attorney. They will be handling a lot of intimate details of your life, and they need to have the full picture in order to advise you properly. Even if a lawyer gives all of the right answers, if you aren't comfortable sharing personal information with them, they may not be the right attorney for you. Thinking about what will happen after you're gone is scary. It helps to have an expert in your corner. Check out our law blog for tips to make your process easier, like this post on how power of attorney is different from a personal directive. For more useful resources, check out our legal resources page or our useful links page. Or, if what you really need is legal advice from a live professional, head to our contact page. This entry was posted in Estate Attorney by verhaeghelaw. Bookmark the permalink.